Last Friday, Dr Jack Kevorkian died at age 83 of natural causes. 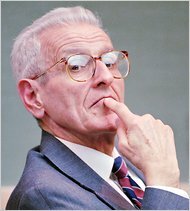 Dr Kevorkian helped people die on their own terms, of so-called “assisted suicide” rather than hideously drawn-out battles with painful diseases, and for his compassion he was rewarded with criminal trials and jail time. When our critters are suffering, we put them out of their misery and help them make a graceful exit, but we don’t display the same compassion for our fellow humans. A Kaddish for Dr Death. This entry was posted in kaddish in two-part harmony, podcasts and tagged assisted suicide, compassion, euthanasia, Jack Kevorkian. Bookmark the permalink.